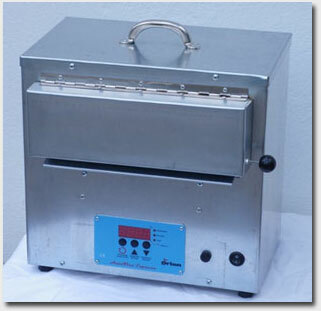 A small kiln designed for annealing beads. The kiln has an ORTON controller. There are 6 programs which can be set to your choice or you can use the program already set up. Before you use the kiln for the first time you have to "burn it out" to get rid of the organic binders that hold the boards firm. This should be done outside. is set to heat up fast to 500°C and hold for 3 hours. After that time it will cool down at 45°C per hour till 470°C . The program will end there and the kiln will cool down in a few hours..
is a fast heat up to 500°C, no hold, slow cool down and off. ( Same as the cool down in program 1). is for batch annealing. 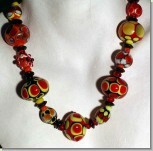 Beads that are already made and cooled in vermiculite can be later batch annealed. Very slow heat up to 500°C, hold for half an hour and slowly cool down. is set for this "burn out". It heats up slowly to 620°C and then switches off. Hold the door open 5mm with a piece of broken brick or a roof tile to vent the kiln. The air enters and the smoke and stink burn out. The boards turn brown first but as it gets hotter they turn white again. After this you can enter a new setting in this program. The "Burn out " you do out side . It gives off smoke as the organic binders burn out.